With “Piece of My Heart,” Janis Joplin became a sensation! Audiences had never experienced such fiery intensity in a female rock star!! That high, husky, earthy, explosive voice remains distinctive. Janis recorded “Piece of My Heart” in 1968 when she was part of the psychedelic rock band Big Brother and the Holding Company. “Piece of My Heart” shot to the number 1 spot on the charts and “Cheap Thrills,” the album it is on, sold one million copies in a month. “Piece of My Heart” is in the Rock and Roll Hall of Fame’s 500 Songs that Shaped Rock and Roll. Janis Lyn Joplin was born in Port Arthur, TX on January 19, 1943. She called herself a “misfit” in high school where she was ostracized. “I’m one of those regular weird people,” she said. In her teens she discovered Lead Belly (Huddie Ledbetter, an iconic American folk and blues musician noted for his strong vocals), Bessie Smith (a popular blues singer of the 1920s and 1930s who was nicknamed the Empress of the Blues) and Big Mama Thornton (Willie Mae Thornton, an American rhythm and blues singer and songwriter). It was the authenticity of their voices that influenced Janis to become a singer. Janis left Big Brother. She put together her own band, the Kozmic Blues Band, and released “I Got Dem Ol’ Kozmic Blues Again Mama!,” which went gold. That was in 1969, when she also performed at Woodstock, a three-day music festival during which 32 acts performed for some 500,000 concert-goers. The festival was captured in a documentary movie, “Woodstock,” and the accompanying soundtrack. In 1970 Janis assembled a new backup group, the Full Tilt Boogie Band, and recorded her final album, “Pearl,” which includes Kris Kristofferson’s “Me and Bobby McGee” and Janis’s “Mercedes Benz.” Janis died October 4, 1970 in Los Angeles at age 27. “Pearl” was released in 1971. It became the top-selling release of her career. In 2003, it was ranked #122 on Rolling Stone’s 500 Greatest Albums of All Time. 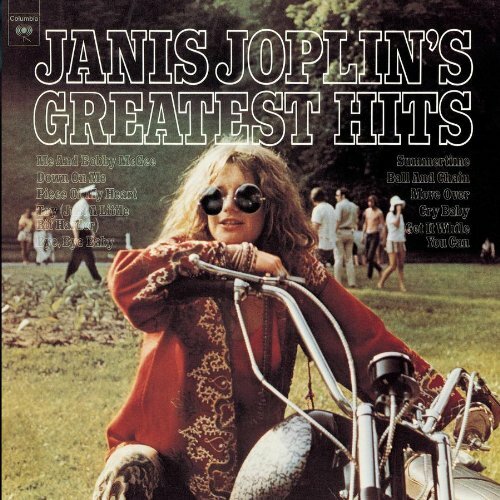 Check out Janis Joplin on our “Women in Music” playlist.